In a touching gesture, the two Tiger Cubs killed in last week’s shootings at Sandy Hook Elementary School have been awarded the Spirit of the Eagle Award. Wayne shared with the BSA family some details from his emotional visit. I can’t imagine the overwhelming heartache he witnessed as he attended three wakes and a funeral for Tiger Cubs Chase and Benjamin, as well as for two girls who were sisters of Cub Scouts in Newtown’s Pack 170. Take a moment to read Wayne’s heartfelt letter below. In it, you’ll find details on the outpouring of support that’s already been felt in Newtown — phone calls, e-mails, and letters from Scouting families from all over the world. And Wayne shares info on how to send supportive cards and letters or make a donation to a memorial fund established by the Connecticut Yankee Council. As I write this message, I am on an airplane returning from Newtown, Connecticut, where along with Scouters from the Connecticut Yankee Council, I attended three wakes and a funeral for the two Cub Scouts and two sisters of Cub Scouts who lost their lives at Sandy Hook Elementary School. We were all overcome with emotion. The outpouring of support was wonderful. People waited in line for hours in the cold to express their condolences and support for the families of all the children lost on that tragic day. The council president, Doug Machin, shared with families that the council established a memorial fund in the names of their loved ones and that the council has received phone calls, emails, and letters from Scouting families from all over the world. The council director of field service, Jon Pleva, presented an American flag to the families of Cub Scouts Chase Kowalski and Benjamin Wheeler, and I presented each boy’s family the Spirit of the Eagle Award on behalf of the Boy Scouts of America. I can tell you, the families were very touched and appreciative. During times like this, we all want to do something. We feel helpless. The Scouters of Newtown understand this and asked me to express their appreciation to you. Right now, what they need most is time to heal as a community. In the weeks ahead, the Scouts and Scouters of Newtown will convene to determine if there is anything more our Scouting family can do for them. For now, our thoughts, prayers, and contributions to the memorial fund are important. If interested, donations, cards, and letters can be sent to the Pack 170 Memorial Fund, c/o Connecticut Yankee Council, P.O. Box 32, Milford, CT 06460. 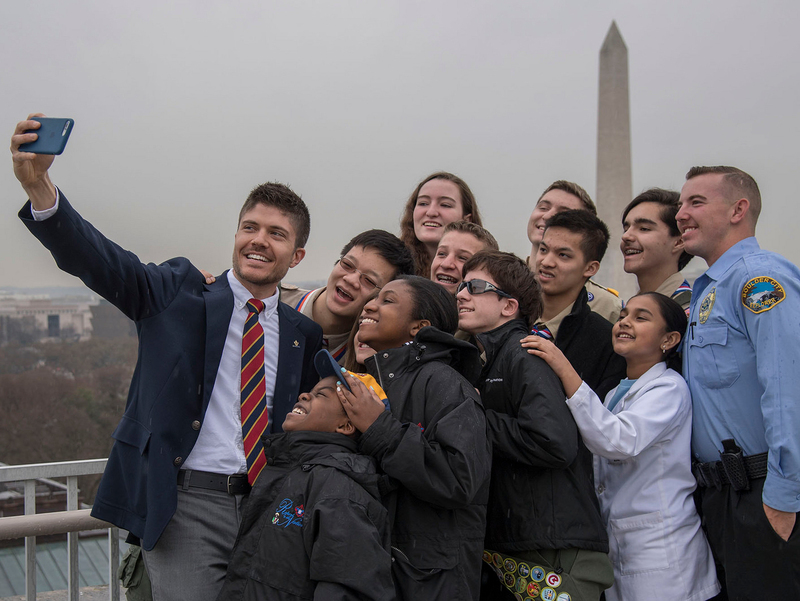 I believe we can take comfort in knowing that even during the sad and disturbing times we experience in the face of national tragedies, the Boy Scouts of America is among the constants that young people and their families can look to for guidance and support. We need strong shoulders, to be sure, to bear such a burden, but it is a load that we have carried honorably and well for more than a century. Our nation’s young people depend on the values we teach, and we will never let them down. I am so proud to be working shoulder to shoulder with each of you in service to the youth of America.